11.11.14 21:10 Account Receive +1.11 Received Payment 1.11 USD from account U8985514 to account U*******. Batch: 73490482. Memo: API Payment. Memo : API Payment. Выплата пользователю Yamanouchi. 11.12.14 18:01	Account	Receive	+0.49	Received Payment 0.49 USD from account U8985514 to account U5485689. Batch: 73565739. Memo: API Payment. Выплата пользователю Corleone. The amount of 50 USD has been withdrawn from your Perfect Money account. Accounts: U5275xxx->U8985514. Memo: Shopping Cart Payment. World Birds Add balance to user 3338.. Date: 20:40 12.11.14. Batch: 73577794. 11.12.14 22:19 Account Receive +1.15 Received Payment 1.15 USD from account U8985514 to account U*******. Batch: 73582867. Memo: API Payment. 11.12.14 17:54	Account	Receive	+3.62	Received Payment 3.62 USD from account U8985514 to account U4731311. Batch: 73565205. Memo: API Payment. Выплата пользователю monitorinv. 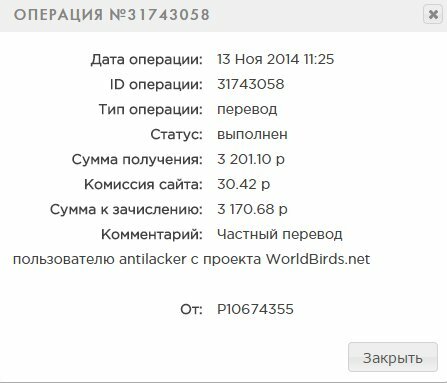 11.13.14 10:20	Account	Receive	+4.03	Received Payment 4.03 USD from account U8985514 to account U5485689. Batch: 73617099. Memo: API Payment. Выплата пользователю Corleone. 11.13.14 14:37	Account	Receive	+1.17	Received Payment 1.17 USD from account U8985514 to account U5485689. Batch: 73639144. Memo: API Payment. Выплата пользователю Corleone. Или я чего-то не понимаю, или в проекте все не так как везде! Я чуть с дуру не купил Лешего, по привычке, чем дороже тем круче! 11.13.14 19:24	Account	Receive	+1.09	Received Payment 1.09 USD from account U8985514 to account U5485689. Batch: 73663112. Memo: API Payment. Выплата пользователю Corleone. 70% от партнерских с сервиса по рибейту.